That is until Happ fills it up again! Wisconsin continues to feed Ethan Happ in the low post, who is grinding his way the players assigned to guard him. 8 pts for Happ. 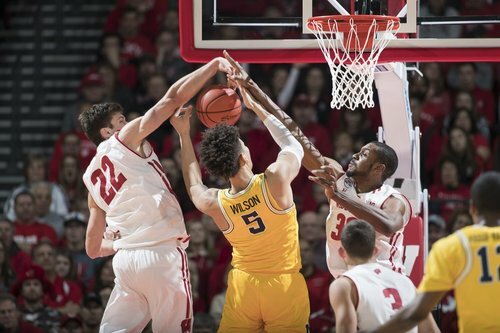 Wisconsin with 14 points in the paint, which has saved its shooting percentage. Badgers lead 24-19 at 3:05. Vitto Brown with a steal, then finishes on the other end with a pretty up-and-under! Vitto: 7pts (3-5 FG), 2reb. #Badgers lead 24-19 with 3:05 left in first half. Happ with 8, Brown 7, and Hayes 6 for UW. Irvin has 9 to lead all scorers. Vitto Brown forces a steal on defense and then an up and under layup on offense! LOOK AT HIM GO! #Badgers ' O is, um, not fluid. UW leads by 5 despite shooting 2-9 from 3 and 10-25 overall. Then Vitto gets a questionable foul called on him as I shout at the television. Brown leads #Badgers in scoring with 7. Has 2 boards and an assist. Active. Oops. Happ has 8 for #Badgers . He is 4-9 shooting. Michigan is shooting 36.4 percent overall, including 5 of 15 on 2-point shots. Vitto Brown is out to get his tonight... and he's doing so! ???? Vitto Brown in attack mode tonight. The senior has nine points (4-for-6) with two rebounds and one assist. H1: Wisconsin calls a timeout with 42.8 seconds left. Badgers lead U-M 26-21. #Badgers Brown 4-6 shooting. Has 9 points, 2 boards and an assist. Brown 1-2 from 3 and 3-4 in the lane area. H1: Timeout Michigan. Wolverine ball with 2.7 seconds left. Still 26-21 Wisconsin. HALFTIME: No.17 Wisconsin 26, Michigan 21. Badgers shoot just 37.9 percent (11-for-29) but score 16 points in the paint. Halftime: #Badgers 26, Michigan 21. No field goals for Michigan over the final 7:10. 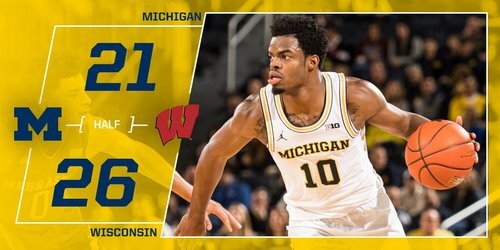 The Wolverines had 2 pts in their final 10 possessions. 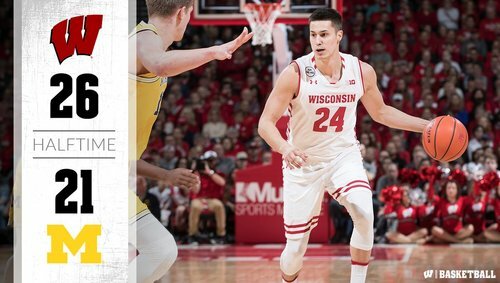 #Badgers burn 2 fouls to cut time to 2.7 and then Hayes steals inbounds pass. UW 26-21 at half. Not the prettiest half, but defense was on point - hold UM to 21 points and 32% shooting. Sooooooo, it's halftime and I guess it was ok? #Badgers up 26-21. Good defense! PPP: #Badgers 0.87, Michigan 0.70. UW shot 37.9 percent, Michigan at 32.0 percent. At the half: @zirvin21 pacing U-M with 9 points. Tune into @espn for the second half. I, @drewhamm5 , have said a lot of mean things about Vitto Brown but he has been the best #Badgers player in the 1st half. I'll eat crow. Nigel Hayes with 6 points, a team-high 4 rebound, 1 assist & 1 steal at the break. "Gah Ethan is so good." 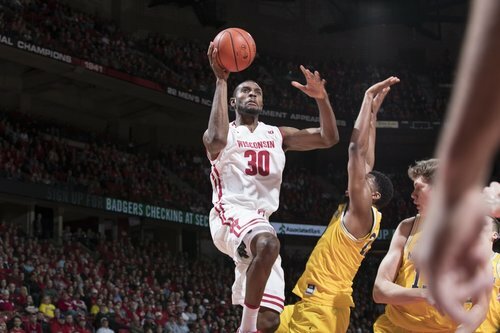 Vitto Brown has game high 9 points (tied w/ Zak Irvin) while Nigel Hayes has game high 4 rebounds. Assists are for losers so not noted here. I refuse to look up the actual stat, but I'm pretty sure Wisconsin held Michigan without a field goal for last 1,000 minutes of 1st half. #Badgers ' bench -- Trice, Hill, Iverson, Illikainen -- has generated 0 points tonight. 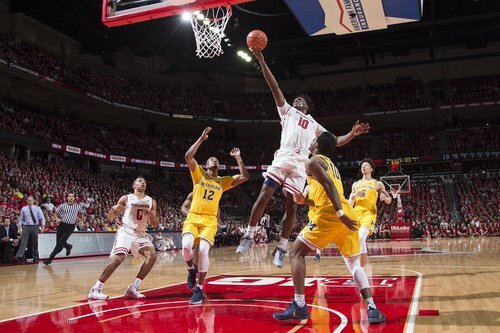 #Badgers doing exactly what you can't do -- letting a struggling team hang around. First 5 min will be interesting. #Badgers Koenig looks PO'd....Very animated. 2nd half about to start. Old Grand Dad Bonded bourbon and Moon Man on deck here in Minnesota! What are y'all drinking?